Thanks Cheryl, for posting your questions! Cheryl asked, "Do you know how to place 2 photos beside each other- or how to write beside a photo?" 1. Upload your photo as usual, by clicking on the "Add Image" icon at the top of the compose window. 2. 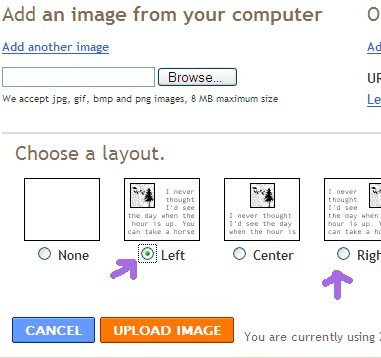 When the image adding window (I made up that name) comes up, make sure you've selected either "Left" or "Right" under "Choose a Layout". If you choose left, your photo will be to the left, and your type will be to the right. If you choose right, your photo will be on the right, type to the left. 3. Add your text(before the photo if you chose "Right", after the photo if you chose "Left"), and you're done! I'll post the answer to her other question tomorrow. Thanks_I guess I could have looked around a bit more and figured it out.... but who needs to do that when they can ask an expert! !